Random Fandom Box is a mystery box created by Geek Studio. We’re two girls bringing awesome fandom items to you! If you talk to us online or by email it’s me you get to talk to! I post on social media, answer emails, and create the graphics for our ads and in box info cards. The behind the scenes worker. I’m the box packer and organizational mind behind Random Fandom. Designated minion and brainstormer when thinking up box items. Choose your fandom! Each box is a limited edition collection of merchandise themed to one video game, movie, book series, anime, or TV show. Every box contains an exclusive t-shirt (unless otherwise stated) along with 6-8 carefully curated items for that month’s fandom. Random Fandom Box IS NOT a subscription box! You choose which months to purchase and you will never be automatically charged for fandoms you don’t want. But make sure to place an order when your favourite fandom goes on sale because once it’s gone, it’s gone forever. The first Random Fandom box was the ‘Hero of Time’ in June 2015 filled with Legend of Zelda merchandise. Other past box themes have included ‘Witches & Wizards’ (Harry Potter), ‘Avenging Heroes’ (Marvel’s Avengers), ‘Road Warrior’ (Mad Max: Fury Road), and ‘Super Effective’ (Pokemon). Check out the Random Fandom shop for more information on past boxes and to see upcoming themes. Sign up for the newsletter to receive reminders of when new boxes go on sale at subscribe.randomfandom.ca. Burlington, Ontario, Canada. If you are nearby you can choose the local pickup option instead of paying for shipping! There are no refunds or exchanges on our mystery boxes. Please make sure you double check shirt sizes before you place your order. Boxes begin to ship approximately a month after the preorders close but can vary depending on box. Individual boxes will have estimated shipping dates on their preorder pages. Once shipped it is 1-2 weeks for the United States and Canada, 2-6 weeks for International Air shipping. Boxes shipping to the United States and Canada come with a tracking number. There is no tracking for other countries. For purchases from the Leftovers Shop tracking is not included. How much does the Random Fandom Box cost? The box costs $25 USD. Some special boxes may be priced differently, but the regular monthly boxes will be $25. You can change the currency using the drop down by the logo at the top of every page. Shipping varies by country. You can get a shipping price on the cart page once you enter your information. Canadian residents will be charged 13% HST. I put in the wrong shipping address! What do I do? If your box hasn’t shipped yet then just send us an email at contact@randomfandom.ca and we can update your address no problem. – When the box is returned to us we can reship it to you with the corrected address, but you would have to pay for the reshipping. – Or when it is returned and you don’t want it sent again we can refund you the cost of the box only. The cost of the shipping will not be refunded. For boxes that have already been shipped the shipping price is non-refundable. Will _______ box be back in stock? No. Once sold out a box will not come back in stock. A theme might eventually be revisited but an exact box will not be up for sale again. Can we pick our shirt sizes? Yes. When ordering you choose from shirts sizes small to 3XL. How do the shirts fit? 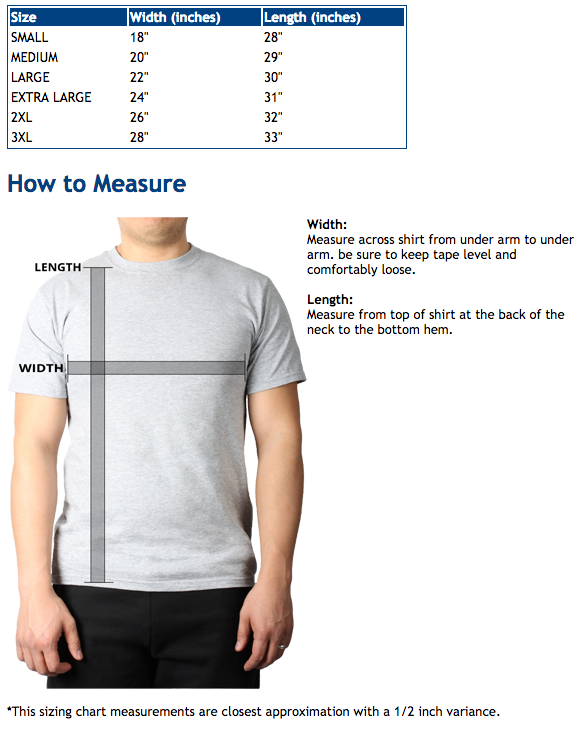 What is the sizing chart? I haven’t gotten my shipping confirmation. What do I do? If you’re worried and haven’t gotten your confirmation send an email to contact@randomfandom.ca with your order number. We will update you on your order status. I got a shipping confirmation but my box hasn’t arrived! Orders shipping to the United States or Canada take 1-2 weeks to arrive once shipped. International orders by Air Shipping take 2-4 weeks and by Ground Shipping take up to 3 months. If those estimated arrival times have passed and your box still hasn’t arrived then send us an email at contact@randomfandom.ca and we’ll check on it. You have 30 days after the end of the arrival estimates to contact us. After 30 days we will assume your box has arrived and the order will be closed. Can I reserve a box? No. Boxes cannot be reserved. The launch date and time are always advertised at the side of the shop page and that’s when they will go on sale. When will the box go on sale? The exact date and time for the next box will be displayed on our home page. They will always go on sale on the first of the month at 12pm (noon) Eastern Standard Time unless it is a holiday. If you have a problem or question about your order please contact us through the Contact page or email us at contact@randomfandom.ca.